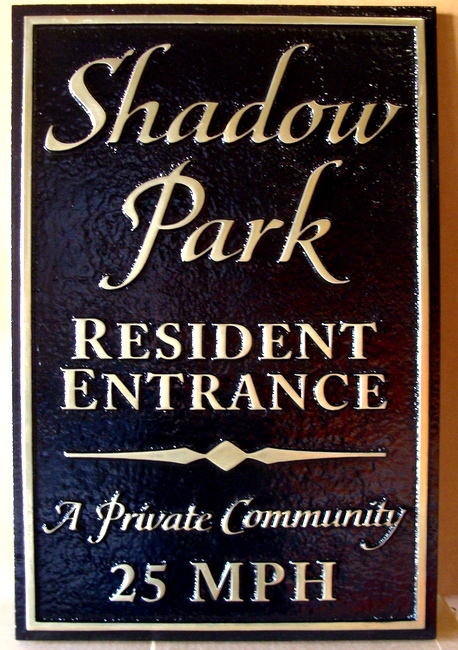 On the right is shown a brass-coated 2.5-D carved High-Density-Urethane (HDU) residence entrance sign for the Shadow Park Community. The text is brass-coated, with a high polish, and the background is brass coating painted black. This sign is 24 inches high, but similar signs can be purchased in any size from 16 inches to 60 inches in diameter. It can also be customized with other text or art. Please click on one of the numbered gray boxes in the lower left margin of this page to see other Galleries . To see prices or get Estimate and Order forms , click on gray boxes in upper left margin. Click on dark gray tabs on the header to see Home and other informational pages.